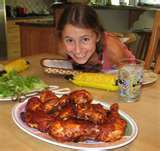 BARBEQUE CHICKEN is a great American family recipe! Southerners take a special pride in cooking this meal for friends & family. Why not try it on your next visit to the Smoky Mountains? Here’s a recipe you can cook at home or the next time you visit us in Gatlinburg, Tennessee. If using charcoal, be patient. After lighting the grill, give it 45 minutes before putting any food on.Self lighting charcoal will be OK after 30 mins but beware, it doesn’t last long. 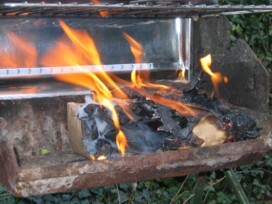 Briquettes are OK but difficult to light and leave a cementitious residue in the base. Lumpwood charcoal & a firelighter and you can’t go wrong. Always use fresh charcoal – if you’ve kept it over the winter it absorbs moisture and simply won’t get up to temperature. If you’re already thinking that this is too much – get a gas barbecue! 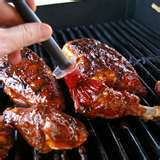 When grilling, barbecue flavour is derived from the fat in the food dripping onto the coals and creating smoke, whether those coals are charcoal or lava is irrelevant. So if you’re a pyronaught like me, get the charcoal out but if you want hassle free cookouts then maybe gas is a better option. Plan your cookout – think about what needs to be ready and when. If it’s too much pressure, take the Tapas approach and do small quantities of lots of different things. A Teflon BBQ mat will keep your vegetarian food “meat free” and also stops patties sticking to the grill and disintegrating.